Summer is almost here and for me that means beaches, hikes, barbeques and camping. I prefer car camping, which is in a tent outdoors, with the luxury of having your car within walking distance. It’s the best of both worlds. You’re still in the outdoors, but don’t have to carry 50 pounds of gear and food on your back to get to your campsite. This allows one to camp and cook gourmet meals at the same time. Want to cook steak with bacon-wrapped mushrooms as a side, no problem. How about bringing a cooler full of ice-cold beer, that’s doable as well. See where I’m going here? I’m excited for an upcoming group camping trip that features a river-hike (yes actually hiking and swimming up a river) to a beautiful and secluded swimming hole. S’mores will be cooked while relaxing around a campfire after the long day hike. In preparation for this, a S’mores pie sets the mood nicely and gets my anticipation up. This Campfire Style Nutella S’mores Pie mimics the beloved campfire classic with a graham cracker and chocolate crust, Nutella filling and marshmallows on top. It’s extremely easy recipe and sure I could figure out a way to make this while camping. On the other hand, maybe I’ll just stick to the real thing out there. The best part is browning the marshmallow topping. Use a cooking torch, or a more accessible way would be toasting in an oven on broil. Just be careful when broiling. Leave the oven open and watch it the entire time. It only takes a few minutes and can go from perfectly golden brown to a burnt campfire black in an instant. Some may like it that way, so toast to your liking. You can make a crust out of pretty much anything. All you need is crumbs, melted butter and some sugar. The recipe below features a graham cracker crust. You can easily replace that with chocolate cookie crumbs, or for a healthier option, crushed nuts. Macadamia nuts? Hazelnuts? You get the point. This kitchen torch is extremely useful. This method of roasting is quicker than using an oven, and much more fun as well. I shot this in natural light at 1/200 sec, f/ 1.8, . So far I haven’t talked about depth of field in any of my posts. Depth of field is important in food photography. Shooting with a larger aperture (smaller f-stop number like 1.8) lets in more light and creates a smaller depth of field. This allows you to focus on a certain object or part of the frame, while blurring the rest of the image. I used this method for this recipe. 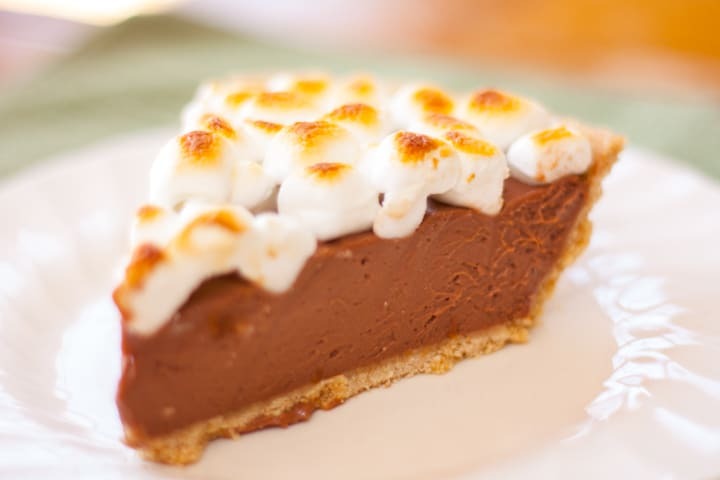 The toasted marshmallows in the center of the pie slice is in sharp focus with everything else slightly blurred, drawing the viewer’s eye right into the image. This also helps in low-light situations, which is common if you are photographing food indoors and the sun is setting behind the trees or a building, just as you have finished your setup and are about to photograph. I mention this from experience, as I have only recently found my perfect window of time for shooting in the evening after a full day of work. Shooting with a smaller aperture (larger f-stop number like 16) lets in less light and creates a larger depth of field. This makes all objects in a scene sharp focus, which is good if you are shooting straight down on a table scene and want everything in full detail. 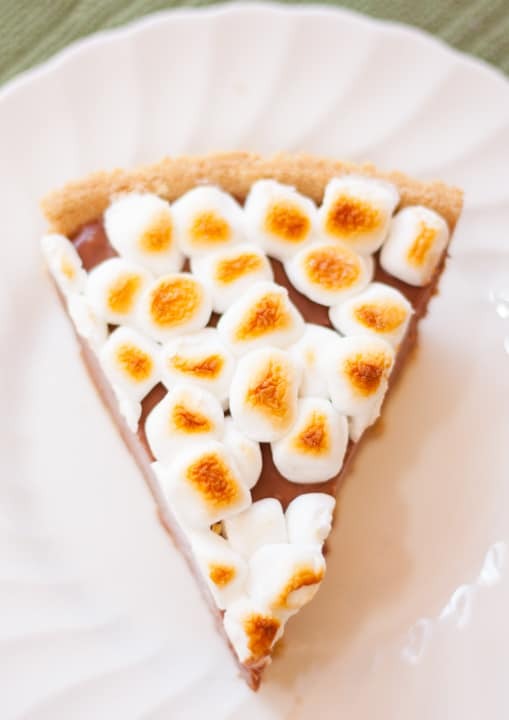 This pie mimics the beloved campfire classic with a graham cracker and chocolate crust, Nutella cream filling and perfectly toasted marshmallows on top. In medium bowl, mix graham cracker crumbs, melted butter, and salt till well blended. Press mixture into bottom and sides of 8 or 9 inch pie pan. Bake at 350º for 7-10 minutes, or until firm. Allow to cool slightly. Place chocolate chips and butter in small bowl. Microwave in 30 second increments, stirring in-between, until melted. Pour into crust and spread evenly on bottom with spatula. Place in refrigerator for at least 10 minutes to harden chocolate. In a medium bowl, beat cream cheese and heavy cream until thick. Beat in Nutella until just combined. Spoon mixture into crust and evenly spread with spatula. Cover and refrigerate for at least 2 ½ hours. Sure you can post a link back to my recipe your blog. Thanks Naveen! Looks delicious! How much sugar goes into the crust? I don’t see the amount listed in the recipe. Thanks! Thanks for catching that Miranda! I decided to omit the sugar in the crust since the filling was sweet enough. I forgot to remove that from the instructions. This is my favorite dessert! Great recipe and great pic! Thanks Olia! I’m glad you like this recipe.